UK: The British government made the first investment of its fledgling Green Investment Bank (GIB) today at the same time as its acquisition of £50 million of shares in a new wind firm was confirmed. The GIB has invested £57.5 million to take a 24.95% equity stake in RWE’s Rhyll Flats offshore project. RWE also sold a 24.95% stake to Greencoat UK Wind, a new fund due to launch on the London Stock Exchange (LSE) with its Initial Public Offering (IPO). The fund will buy operational UK wind farms from RWE and SSE. The interests in six onshore and offshore wind farms comprise a net capacity of 126.5MW. In addition to Greencoat’s Rhyll Flats stake, RWE confirmed today that the fund would be buying a 41% stake in the utility’s Little Cheyne Court wind farm, a 59.8MW project in Kent. Greencoat’s total investment in the two RWE projects is £107.7 million. Today Greencoat confirmed it is set to raise £260 million in its IPO. Buyers of shares include the UK government via its Department for Business Innovation and Skills, which has subscribed for 50 million shares at a price of £1 per share. SSE is also investing in the company, taking 10 million shares. 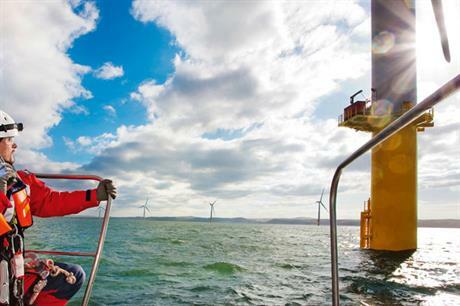 For more on the GIB’s Rhyll Flats investment, go to Windpower Offshore.